We had hoped to arrive in Arequipa at 6AM and join a trip to the Colca Canyon (most leave around 8-9AM), but due to general ineptitude of the Cruz Del Sur bus company we didn't make it to Arequipa until 9AM, and all the trips had already departed for the day. So instead we stopped at nice-looking cafe and indulged in an 'American-style' desayuno (breakfast) with scrambled eggs, a nice treat after the monotony of simple bread rolls and papaya juice which is served up at pretty much every hostel/hotel in Bolivia & Peru. But our culinary adventures did not end there. 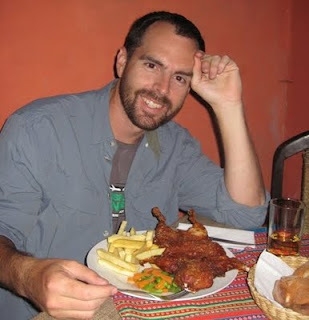 For dinner we had a Peruvian delicacy of cuy, which is guinea pig. The whole animal, buck teeth and all, splayed out and crispy on a dinner plate. I can't say it was anything spectacular - tasted very much like tender chicken meat, but took a heck of effort to get at the very small slivers of meat within - then again, maybe I just had a thin one...the ones I saw alive in the pens in other restaurants looked a lot more meaty. Since we had missed out on a two-day tour of Colca Canyon, we instead booked a day tour, which is a pretty aggressive trip that begins with a 2AM pick up and wraps up around 5PM the same day. We decided not to press our luck by partying until 2AM and instead called it an early night, around 10PM. The early pickup is necessary so that you can arrive at the lookout point for condors at a good time. Fortunately we were rewarded for our early rise with three condor sightings! We had a great tour guide, Irena from Colonial Tours, who told us a ton about the Colca Canyon, Arequipeno culture, and history. 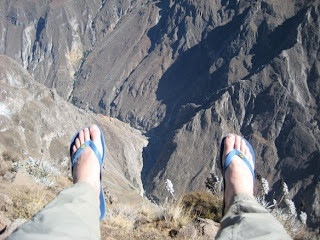 The Colca Canyon is deeper than the Grand Canyon but not as visually stunning (in our opinion). Still, it made for a solid and entertaining day trip. 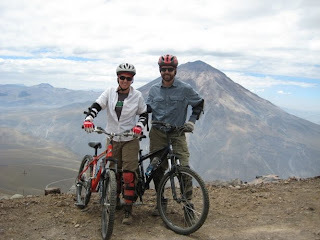 On our final day in Arequipa we did some mountain biking. We had hoped to join with a larger group, but we ended up on our own private trip down the side of the Chachani volcano (one of three volcanoes that surround Arequipa). Starting from an altitude of 4900 meters, we (mostly) descended for about 2 hours on fire roads, rough single track, sandy single track, and finally asphalt. The views of Arequipa were amazing, the wildlife mostly lacking; and we finsihed with only one very minor crash along the way. It had been a long time since either of us had done any mountain biking, but it was a good way to get some activity in before our 16 hour overnight bus ride to Lima, which left later that day. Todd had booked the bus tickets and we had expected to get a full cama seat for the long bus ride to Lima. However, Passport Junkie clearly has some additional research to do in South America - we stepped on the bus and noticed only regular seats, even less comfy than the 'semi-camas' we had on our previous trip. There was no choice but to buckle down and try to bear out the ride. At first we were worried that no food or drink would be served - in anticipation of the cama/1st class service we had only a small bottle of water and had left our emergency food (CLIF bars) in our checked luggage. Fortunately about 3 hours into the ride we were served a little dinner and drink. Then we popped the Advil PMs and fell asleep to the sounds of others' snores and the movies (but not before Todd finished watching the movie Troy). Recommendation for travel in South America - bring an eye mask and earplugs - they can make the bus rides a lot more comfortable! Fortunately the bus was in better working order, we rolled into Lima on schedule around 9AM the next day, to begin our final two days/one night in Peru.